The wild species from which florists’ cyclamen are derived is Cyclamen persicum. Many spring visitors to the Mediterranean islands of Cyprus, Rhodes and (Eastern) Crete are likely to have seen it in flower there but it grows also (together with a few other places) on the islands and coastal areas of the Eastern Aegean and around the North Eastern corner of the Mediterranean from southern Turkey to northern Israel. It can grow in great drifts of thousands of plants, the commonest flower around, and fill the air with a sweet scent. However, Cyclamen persicum is only one of around 23 species, some of them frost hardy, one or another of which can be in flower from late summer until late spring. Buying or being given one of these as a present is most people’s first encounter with a cyclamen. Florists’ cyclamen are cultivars of the wild Cyclamen persicum and are sold in millions all over the world. Coming into flower during the winter in a range of colour shades from white through pink to red they are hugely popular as houseplants around December/January in the northern hemisphere. They are also used as bedding plants, particularly around the Mediterranean, and in window boxes in northern European cities. Unfortunately, they are not completely frost hardy which restricts their use as garden plants in areas with hard winters. Fortunately, species such as Cyclamen coum and Cyclamen hederifolium can be used for that. Florists’ cyclamen have been bred over more than 150 years. Initially selected for a wider range of colours, based on the white and pink seen in wild Cyclamen persicum and for larger flowers. At the same time different petal shapes arose, flattened (the wild version is twisted), fringed (toothed edge) double and others. More recently these efforts have extended to re-introducing scent, lost during the development of larger plants, increasing the extent and intensity of leaf patterning and developing more sizes, so they are now available from tiny, through small, medium and large, to giant (Micro, Mini, Midi, Maxi, Magnum). Perhaps you have a cyclamen on the windowsill which is looking a bit tired but it was given to you by someone special or you particularly like it or you forgot to water it and when you remembered the leaves were a bit yellow and didn’t turn green again. Don’t despair! The wild plants are long lived, resting through the long dry Mediterranean summer and growing again once the winter rains start. The houseplants will respond the same way. Water regularly until spring, not too much – more cyclamen die from over watering than ever die of drought, then reduce and leave virtually dry over the summer. Start watering again in early autumn and your plant should grow and flower again. The questions and answers below are based on emails received by the Cyclamen Society Panel of Experts. The questions most frequently asked relate to Cyclamen pot plants (florists’ Cyclamen or Cyclamen persicum cultivars) so these appear before those dealing with other ‘hardy’ species growing in pots or in the garden. Many questions need very similar answers, but correspondents have said it is helpful to find something closely resembling their own problem. If you have questions not answered below, you can email us at expert@cyclamen.org – but please read the FAQs first, it may also save you having to wait for a reply! If you do email a question, please be sure to mention where you live. It makes a big difference whether you are in the northern or southern hemisphere, in the Arctic or at the equator and your email address may not help us to work this out. 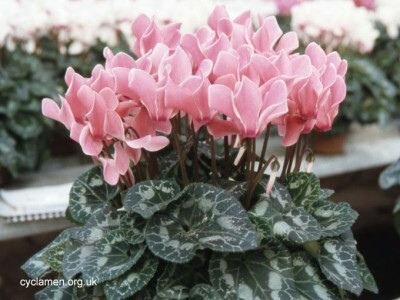 What are the basic requirements of a Cyclamen pot plant? Cyclamen pot plants need a light position but not too much direct sunlight. A window ledge that does not face south is ideal but on frosty nights, unless you have double-glazing, you should bring it into the room. It will be happy at normal room temperatures but shouldn’t get too hot and will last much longer in a cool position (55°F/13°C). Watering incorrectly generally causes the most problems, usually when too much water has been given. The leaves may go yellow or flop if too much water is given but this is often taken as a sign the plant is thirsty and more water is given, which makes the problem worse, often with fatal results. So, always wait until the compost feels fairly dry but avoid waiting so long that the plant becomes limp. You can water from either the top or the bottom but afterwards the pot should be allowed to drain properly and any water remaining in the saucer or potholder after 5 minutes should be tipped away. If possible, avoid splashing the centre of the plant as rot often starts there where the leaf and flower stalks are packed together. You can feed with a pot-plant liquid food (e.g. Baby Bio) about every 2 weeks, but be aware that overfeeding is more likely to produce foliage rather than flowers. Dead flowers or leaves should be removed carefully by giving their stems a sharp tug. I live in the USA and usually have rain. However, lately (late July) it has been very hot. The plants’ leaves are turning yellow and are dying. They are no longer blooming. They are in a wood planter and I water them only when they need it. What is going on? Are they going to a dormant stage or are they dying? Please help me save my plants if I can. Cyclamen are Mediterranean plants and follow the regime of ‘come into growth in autumn (fall)’, ‘grow through winter and spring’ and ‘go dormant in the summer while there is no rain & loads of sun’. They flower either in autumn or spring. Yours are probably florists’ cultivars of Cyclamen persicum that flowers in spring as a species but the cultivars will flower all through the growing season. Putting it simply, your plant is going dormant for the summer and you should stop watering until September/early October. If you keep them too moist over this period then the tuber may rot. The leaves of my cyclamen are turning yellow. Does this mean I watered too much? It could mean that. I assume that you are talking about a florists’ cyclamen – that is, a Cyclamen persicum cultivar that you keep in a pot in the house. If it is this sort, the most likely causes are overwatering or keeping it in too warm a place. Since Cyclamen are native to the countries that surround the Mediterranean and grow in the autumn, winter and spring, too much warmth means it feels like summer and time to go dormant for a few months, as a tuber (a bit like a small potato) under the soil/compost. You should keep it in a cool place (50F is ok) and let it almost dry out between waterings. The idea is to give it a good soaking, let it use up all the water (without the compost getting so dry that either the plant wilts or it is so dry it won’t wet again), and then soak it again. You can expect that by the end of April it will want to go dormant anyway, so you should stop watering then until September. If it is not a florists’ cyclamen, the problem could still be too much water, but you would have to tell me more about it. I have recently acquired a cyclamen and have no idea how to care for it. I don’t know the exact species. The first 2 weeks I had it there were no problems. It bloomed and seemed healthy. Now it looks sick. It has gone from being thick with leaves to very thin. I normally have no trouble with plants and they are all over my house in wide variety, but this one has me done. I guess you are talking about a Cyclamen pot plant you bought in a florist’s shop or garden centre? If so, it is likely that you are keeping it in too warm a place in the house. They really need to be kept cool (50F) and not overwatered. You don’t say where you live, so I can’t guess what your outside temperatures or rainfall, etc. are like, so I will assume that it is at least similar to the southern U.K. i.e. warm but not hot summers, rain on and off all year, at least some frosts in winter. In this situation, you cannot grow the plant out of doors except during the summer months, when it should be dormant anyway. You can easily grow it as a houseplant provided you keep it fairly cool. It won’t be too happy with a house heated to 20C/70F with the dry atmosphere that goes with that. Keep it in the coolest place you can, away from radiators. It will like sun but not getting scorched on a south facing window ledge. Don’t keep watering it. Give it a good soak by standing the pot in a few inches of water for a while, let it drain, then leave it alone until the compost is quite dry, before giving it a good soaking again. After it stops flowering in about April (northern hemisphere) the leaves will go yellow and wither. Stop watering at this time and put the pot somewhere cool and dry for the summer. When you get the chance during the dormant period, repot the tuber (it will be like a small flat potato) into a slightly larger pot. If possible, use compost that is loam based, with added grit and a handful of something like peat as well. You can use soil-less compost but it makes watering more difficult – especially at the end of the dormant period when you want the compost to take up moisture again. In about September (or when you see growth starting), soak the pot. If no growth had shown when you watered it, wait for shoots to appear before watering again. I have just received a lovely, potted cyclamen from a friend on the occasion of my Mother’s passing and would dearly love to keep the plant healthy and beautiful for as long as possible. I live in the outskirts of Washington D.C. in the U.S. and don’t know if my clay soil will be healthy for the plant. Also, it gets very hot and humid here in the summertime. The plant is good-sized, has medium green/silver veined leaves, the flowers being almost perfectly white with deep magenta edges, the edges being highly ruffled. If it is a potted Cyclamen it is almost certainly a florists’ cultivar of Cyclamen persicum. They really like cool conditions and, if they get too hot, will tend to go dormant. C. persicum is a Mediterranean plant which grows at (generally) low altitude and is not frost hardy. It comes into growth in the autumn (fall), flowers in the early spring (February-March) and goes dormant for the entire summer. The cultivars are normally grown in pots as houseplants – but here the problem is that they really want temperatures around 50-55F when in growth and the dry heated conditions we tend to live in these days in the winter don’t suit this. So you need to find as cool a spot for it as possible. It could be planted out, but would prefer a well-drained soil, and is likely to go dormant at some point. Also, I don’t know what your winter temperatures are like, but you would have to lift and repot it if you have frosty winters. Please take into account that repotting Cyclamen when in growth is not the easiest thing to do. Really I would recommend that you let it go dormant in its pot. Repot it into something larger in a free draining compost which will re-wet OK in the autumn (the compost it is in is probably peat-based and will be really difficult to re-wet), keep it dry (but not totally dessicated) over the summer and let it come back into growth in the autumn. Please tell me that, although I was negligent and left my potted plant exposed to too much sun one day, it will survive. It continues to wilt and die. The top growth will almost certainly die off. This is not too much of a concern as at this time of year (northern hemisphere – April) Cyclamen are starting to think about going dormant for the summer anyway. I am saying this, of course, without knowing where you live. Cyclamen have a tuber (similar in some ways to a potato) that is the storage organ they use to remain alive during their dormant summer period. They come into growth in the autumn (fall) and, if we are talking about a florists’ cultivar (which is derived from Cyclamen persicum), will come into flower between Christmas and roughly March. Often it is possible to buy them in flower in the autumn (fall), as they can be forced to flower by artificially controlling temperature and light levels. The important thing for the moment is for you to keep the compost just moist until the plant decides if it is going to put up new leaves now or go dormant. If it decides to go dormant, overwatering it will possibly end up with the tuber rotting. Even if it does put up new leaves now, it should still go dormant for the summer, in which case you should keep it almost dry and in a cool place until about September. I have a question about my cyclamen. I have no idea what species it is, but maybe you can help me. I bought it about a month ago and the flowers stopped growing. It is a potted plant and it lives in the living room of my apartment. I put it next to the window and open the blinds during the day. The leaves were turning yellow for a while, but I put some Miracle Grow on it and the leaves now look fine. Is there anything I can do to it to make the flowers start growing again? I suspect that what you have is a florists’ cultivar of Cyclamen persicum. This is really the only sort that would be sold as a pot plant (as opposed, that is, to something you may buy in a pot from a garden centre or nursery, which is more like a rock plant). C. persicum cultivars really prefer cool conditions (55F) and not too dry an atmosphere. Also, although they do like some sun, in the wild C. persicum is either a woodland plant or it will hide its tuber under rocks with just the leaves and flowers poking into the light. Around now (northern hemisphere – April), it is likely to be going dormant for the summer and the leaves can be expected to be going yellow soon anyway. When this happens, let it become fairly dry and have a rest (without the compost getting so dry that you can’t get it wet again!). I recently received a cyclamen plant as a gift. It was originally in a plastic container. I do not know the species, but it had 4 to 5 pinkish flowers, which drooped or hung somewhat, and green leaves. The plant flourished at first, and then the flowers slowly began to disappear. Over the next few weeks, each leaf began to die. When there were approximately 4 to 5 green single leaves left, I repotted into a larger clay pot with the addition of plant food, in an attempt to save the plant. However, this attempt was to no avail as the plant subsequently and apparently died completely. Additionally, the only trauma the plant received was a few eaten leaves by cats shortly after the plant was brought home. I watered from the bottom only and according to your instructions contained in your online article. Now, no leaves or flowers exist – only the root system is left. Please respond to the following questions at your earliest convenience: Will the plant return from the soil? Is it merely dormant? What should I do? What did I do wrong? How can I tell the species? If your Cyclamen was sold as a pot plant, it is almost certainly a florists’ cultivar derived from Cyclamen persicum. At this time of year (northern hemisphere – April), I would expect any cyclamen to be thinking about dormancy. They basically grow in the autumn (fall), winter and spring, and are dormant in the summer. Just when they go dormant will be determined to some extent by they conditions under which they are growing. Too much heat in a sunny window, for instance, will encourage early dormancy, whilst growing in light but cool conditions may see them continuing into mid-May. I suggest you run with what the plant wants to do, and when the leaves have gone yellow, withhold water and let it rest until September. Keep the pot in a cool place, if possible, and dry – but not so dry that the compost will never wet again! Please help me. I’m killing it. A friend gave me a Cyclamen last Sunday and I have already had two leaves turn yellow and die, and three more are turning yellow. I seem to be killing it rather quickly. I have watered it from the bottom, pouring off water not soaked up in 15 minutes. I have given it some half strength liquid plant food. I tried it in a north facing window, then an east facing window where it got quite warm, and now have it back in my only north facing window. What can I possibly be doing wrong? We live in the top of the Rockies at about 8700 feet elevation. There was nothing to tell me what kind it is, but I assume she got it at the grocery store. It is very small, in a very small plastic pot, one of those decorated with a paper cover over the pot and a matching bow. I removed the paper cover and put it in a saucer. I would appreciate any information you can give me. Go dormant in late spring/early summer. Your plant is very likely to be a florists’ cultivar, bred from Cyclamen persicum, which has been retarded by starting the tuber off late. C. persicum naturally flowers through February-March-April, but the florists’ forms are brought into flower anytime from (northern hemisphere) September through April. In any event, I would expect it to be going dormant around now (northern hemisphere – May), and it will rest in its tuber until about September. I suggest you keep it more or less dry (but not dessicated) until about September, then give it a little water and leave it until you see new growth appearing before watering normally. ‘Normally’ in this sense means: Soak the pot, then let it use up the moisture until the compost is fairly dry, and then soak well again. Cyclamen do not really appreciate a constant dribble of water. They like to be kept in good light, but not direct sunlight, and cool – maybe 55 degrees Fahrenheit. Keep away from central heating etc. The yellowing leaves are probably due to over-watering and/or getting too warm. I would suggest that once all the leaves have gone (or turned yellow & been pulled off) you have the tuber out of the pot and put it in something larger. Since you need to keep it dryish over the summer, choose compost that will re-wet easily. Peat based composts often dry out too much and are difficult to re-wet again. Whilst it is dormant, try to keep it as cool as possible. Certainly keep the pot out of direct sunlight. Do indoor varieties of cyclamen go dormant? I have a few pots that were beautiful in the winter and now (northern hemisphere – May) barely have any leaves. I thought that perhaps they were not getting enough light since the amount of sunlight may have decreased as the foliage on the trees has created a great deal of shade around our house. But having just read about cyclamen on your home page I was wondering if perhaps they are just going dormant. These are miniature cyclamen. Do you have any insight into what may be going on with these plants and what I should do to restore them to their former beauty? Yes, they have gone dormant. They should certainly have done so by now, although I wouldn’t have been surprised if it had been some weeks ago. They need to be allowed to rest until the autumn (fall) by keeping the pots dryish and in a cool place out of direct sunlight. If the tubers (a bit like a potato) are still in the original pots – which are usually rather small – then I suggest that while they are dormant you should repot them into something a little larger, but do not water them. Try to use compost that will re-wet fairly easily – maybe something which is loam-based, with some extra grit in it. The problem with most peat-based composts is that if they dry out completely the air trapped in them prevents them from re-wetting. If you get this problem I suggest you add a couple of drips of hand dish-wash detergent/soap, which will not harm the plants, but will act as a wetting agent. In the autumn (maybe September, but possibly into November) when new leaves start to shoot, give the pots a good watering. Soak them well, and then don’t water until they get dryish – then soak again. If you get worried that they aren’t doing anything by late October, as long as the tubers are still plump and hard they will be OK, but you can start them into growth by watering at this point. Don’t worry about shade. Cyclamen persicum from which the florists’ Cyclamen are derived, is basically a woodland plant. They love cool shade. I have just bought a white Cyclamen from a store, and was hoping that you could give me a really brief description on how to care for it. (i.e. when and how much water; how much sun; fertilizer; etc.) I have just started getting interested in plants, and therefore any help you could give me would be greatly appreciated. I really don’t want to kill such a beautiful plant. I live in an apartment that receives morning sun and is fairly bright the rest of the day (although without direct sun after 11 a.m.). The main things really are keep it cool, out of direct sunlight, and don’t over-water. Let it dry out, then stand the pot in several inches of water to give it a good soak then let it drain and leave it until it is fairly dry before repeating the process. What you have is probably a florists’ cultivar of Cyclamen persicum that has been forced into growth. They are naturally winter-spring flowering plants. Could you please tell me when a good time to transplant it would be?? I am still getting new budding shoots on my plant, but I know one of these days, it will be too big for the small pot it’s in. Best time is when it is dormant. Really, you should wait until the plant ‘starts to move’, and then repot. For example, assuming the leaves die off and it goes dormant in April, then if you repot in July you should find that the roots have just started to produce a few new shoots, although there is no evidence of growth above the compost. The only downside to this is that if you pot it into moist compost then it may start the plant into growth before you really want it to. It’s not really a silly question! Up to a point, it depends on the species. However, as a general guide – assuming there are no visible roots, then you will find that one side has the growing point, and the other side has nothing. Plant with the growing point upwards. Otherwise, if it’s saucer shaped, plant with the convex side downwards/concave side upwards. Incidentally, they are tubers, not corms! I bought some hardy cyclamen last fall, before I found out they were possibly not hardy in my Zone. I live in the USA in Zone 5, Kansas City Missouri. I believe we are pretty far into this zone, but I am not sure. We have fairly mild winters here–not a lot of snow, but we do get down into the sub-zero Fahrenheit temperatures for about 2 weeks in mid-winter. I found no leaf growth this summer, but now have found that all four bulbs are flowering quite profusely. I was surprised, as I assumed that they did not make it. My question is: will they begin to grow leaves over the winter? Do I need to mulch them? I have them on the north side of my house, and I did not plant them very deep, as you do not plant the indoor variety very deep. How fast will they multiply? It is likely that the plants are Cyclamen hederifolium. I will assume that this is the case, but you may care to look at the Species pages on this web site and see if they match what you are seeing in your garden. Leaves will come before flowering finishes. You could mulch them, but this is better done during the summer, not now they are growing. If they are C. hederifolium, then they really are bone hardy and will survive the climate you describe – particularly if there is snow cover during the very cold spell. Incidentally, they do not have bulbs, but tubers – a bit like a potato. As for depth – they may pull themselves a bit deeper, but they don’t really need to be deep under the surface. They will only multiply by seed. They should set seed fairly freely which will be spread around by insects. It takes about 2-3 years from seed to flowering.